Since we produced Patch Praises 3 fourteen years ago, many of you have asked for more volumes of the Patch Praises collection. We are happy to offer Patch the Pirate Praises 4, a new collection of 38 Patch songs. 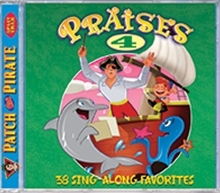 In the same split-trax format as the previous three, children can sing along with the choir or with just the music. The easy-sing, easy-play songbook has simple arrangements suitable for beginning pianists and young choirs.